An abode of one of the 12 Jyotrinlingas of India Bhimashankar, with its dense bright green jungles in the Western Ghats and sacred allegory, often establish its pluck as a fine experience away from the hustles and bustles of city life. 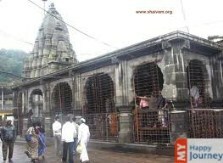 On the brink at a height of 3,250 feet, the temple is sited unerringly in the village of Shiradhon, which is quite close to the city of Pune. It is positioned in the Ghat province of the imposing Sahayadri Ranges. Bhimashankar is blessed by nature and as per the legends the impenetrable jungles here served as a safe refuge for the Pandavas. The place got its name from River Bhima which emerges from this sanctified place only. For religious minded people places many things to offer. The chief draw here is the consecrated Bhimashankar Temple. The Mokshakund Tirtha which is located just behind the Bhimashankar temple is also a place to visit. Apart from this some other important religious destinations are the Kusharanya Tirtha and the Sarvatirtha. This place is not only a pilgrims ecstasy it is also a great place for the people who have a special appreciation for the miraculous power of nature. The place offers a large number of trekking opportunities, amongst the hilly terrains of the Sahayadris. Nature fanatics would do well to discover the tranquil veiled depths of the Bhimshankar Wildlife Sanctuary, where the local bio-diversity has been assiduously secluded for generations. Bhimashankar can be easily visited as a day tour from Pune. A whole lot of night stay options are also available which provide you an opportunity to spend your time in a tranquil environment. A must visit place of India, is undoubtedly a nature’s abode that reverberates with a dazzling exquisiteness, conceitedly flaunting its rich green legacy.